Since my last blog the pups can now see and hear and are able to get around on their own four feet. I have removed the pig rails to create more room in the whelping box. In these early days they spend the majority of their time sleeping. Here they are having a little burst of energy in between sleeps. One of the pups Elsie in the black collar always ends up lying between mum’s front paws. Eyke in the Silver collar did make an attempt to acquire that position but Elsie soon saw that attempt off. Sasha spends lots of time in with her pups but her favourite spot is looking down from her sofa where she can relax and doesn’t get too overheated. This will become very important as their teeth and nails grow making feeding unpleasant allowing her to withdraw but still watch over them. What I find remarkable that even at only 2 weeks old they already do their toileting on the paper and not on their bedding. This has been the case with all of our litters and clearly showing they have an inbuilt desire to be clean. Sasha has been the most amazing mother to her pups providing round the clock care and a constant supply of rich nutritious milk. We feed her a top quality puppy dry food with raw minced beef and chicken wings 3 times a day. Plus she insists on her Weetabix and goats milk at 9pm each night. At around 21 days she started to reduce the number and length of her feeds preparing them for weaning. Weaning is the gradual reduction of a puppy’s dependency on his/her mother’s milk. I start the process of getting the pups ready for solid food by feeding each pup a walnut sized piece of mince beef. From here I give them small amounts of blended puppy food mixed with raw minced beef. I insist on each pup having his/her own bowl to make sure they each get what they need and also it gets them used to handling and to realise that human hands around their food bowl is a good thing. They had been threatening to climb over the front boards since day 14 and here are Eyke (Silver ) and Eddie (Blue) attempting to join mum on her sofa. Sasha wasn’t having any of that, Knocking them both back inside and then giving them all a feed. Whilst I appreciate not all pups can be born and raised in a home environment there is no doubt it gives mum and pups the perfect start in life. Here is a video of mum and pups in complete solitude away from prying eyes and noise. They are getting good quality rest which aids their wellbeing and development. I weigh the pups every other day just to keep an eye on their development. There is no doubt having just 6 pups means there is plenty to go around for everyone and this has been shown by how even their weight gains have been. Here is Eddie happily sat in the weighing box. This weekend I opened up a bigger area for the pups and as their eyesight improves I will open it up further. You can see from the video their eyesight is still very hazy and they are still very reliant on their nose to locate mum. 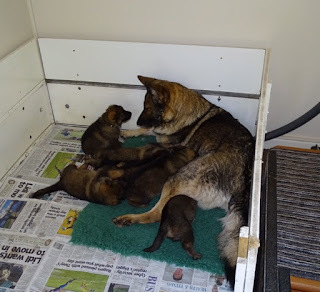 This weekend Sasha’s full time Carers Julie and Les who live near Bath came down to see her and her pups. You will see from the video she was very pleased to see them along with Julie’s sister Karon. Before going to live with Julie and Les, Sasha lived with my family for over 2 years and had her D litter with us. Now that Julie and Les are her carers Sasha will live with Julie and Les for the rest of her life. Sasha very proudly showed off her pups to Julie and Les. Julie couldn’t resist lots of cuddles and helping out feeding them. Here she is feeding Eyke. With snow on the way they had to leave to get back to their home in Bath. They will be popping back to see Sasha and her pups again. 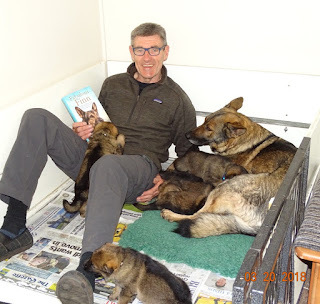 When the pups leave for their new homes at 8 weeks Sasha will return to Bath with Julie and Les. We had a worrying day yesterday when Sasha was overloaded with milk and one udder was huge and obviously uncomfortable. Sasha wouldn’t feed the pups and was whining constantly which I interpreted that she wanted to feed but something was preventing her from doing so. I checked all of her teats repeatedly but could find no signs of a problem and I decided a veterinary visit was in order. I heard her whining through the night but when I went to see her this morning she had obviously fed her pups and now seems back to normal. As we now move into the weaning stage the real work starts as I start to take over feeding and cleaning from mum. I have received my copy of the Fabulous Finn which I am really looking forward to reading. However with 6am to 10pm days ahead for the next 4 to 5 weeks it is something to look forward to on our Hols in May. Here are the pups last night having some playful banter before retiring for the night. Today the pups are 3 weeks and 4 days old. I will be compiling another blog when they are 5 weeks old. Because of the recent weather I have had to cancel a number of training sessions. I managed to get some training in with Henry, Lola, Lulu and Ben. Here is Henry practising his hold and leave with puppy walker Jill. Like most Dutch herders and Malinois getting them to bite is never a problem and so ensuring that they always understand that they must leave on command is vitally important. Control is therefore very important as demonstrated here by Jill working on Henry’s down stay. His tracking is also progressing really nicely. Henry would be a handful for anyone and Jill and Terry’s experience having puppy walked 11 pups is paying dividends. Here is 3 month old Lola with Karol getting in some practise on the ramps in preparation for the forthcoming Devon county show. Here she is again being assessed on different floor surfaces and various noises in the pavilion. She was very confident and not at all sensitive to sounds. Here is Lola’s sister Lulu with puppy walker Margaret on the Agility ramps and also practising her down. Here she is pictured in the pavilion doing a sit. I collected Lulu and her sister Lola from the breeders in January. From the moment I arrived home I had my doubts about Lulu in terms of her lack of confidence. This was very apparent on her puppy assessment and has been consistent on the occasions I have seen her with her puppy walkers. Because of this I have had conversations with Margaret about not getting too attached but Margaret fully understood and was happy to see how she got on. Reluctantly I have decided to return Lola back to Ian the breeder at Lorokmor working dogs. She has many endearing qualities and it is rare that I would release a puppy quite so soon but I do not think she has the necessary confidence and strength of character to become a Police dog. To date we have had 6 puppies from Lorokmor working dogs ie Merlin, Henry, Bill, Ben, Lola and Lulu. With the exception of Lulu I am very happy with the progress and development of the remaining pups. Here is Ben taking everything in his stride on our last training day and showing a natural aptitude for tracking with his puppy walker Lyn. Pictured here are Lola, Lulu and Ben on our last training day. 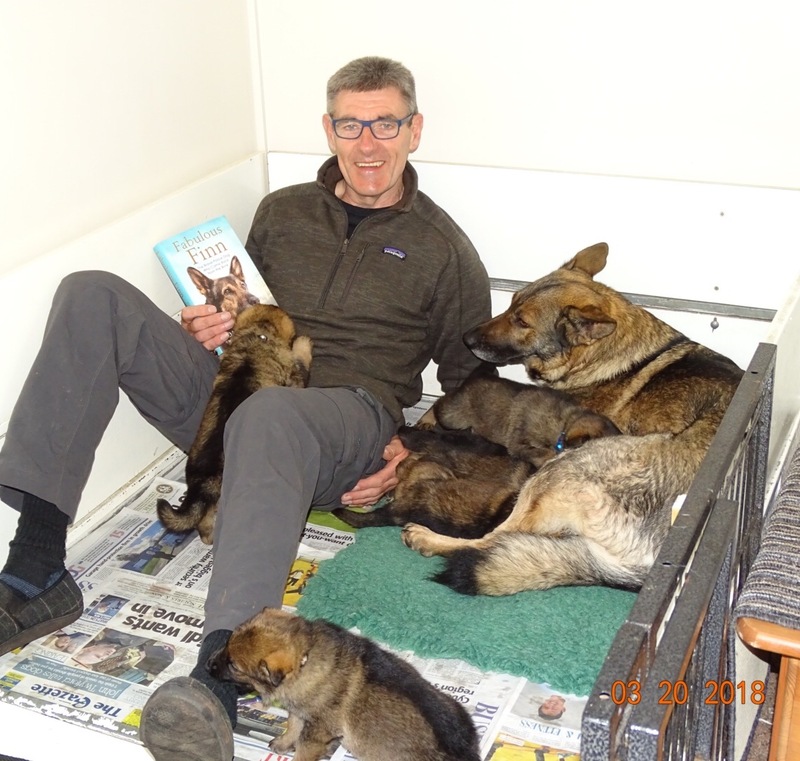 We have 2 15 week old puppies Star and Sidney arriving from Tiekerhook kennels in Holland in 2 weeks’ time to join our existing three January 2019 pups Bill, Ben and Lola. I hope to do some training with Peppe, Merlin, Henry, Quest, Quini and Gunnar on Sunday and possibly out with the Initial course next week. None of this would be possible without my long suffering wife Diane who will be looking after the pups and Sasha while I'm out. 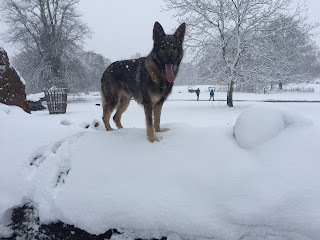 I will leave you with a picture of my young girl Ella out enjoying the snow.